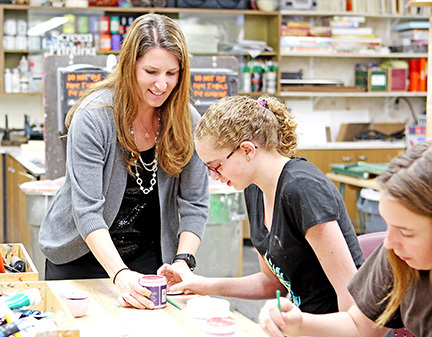 North Bend Central middle and high school principal Brenda Petersen helps Tiffany Burson during art class. Petersen says the students are the best part about being principal. Brenda Petersen was named High School Principal of the Year for Region 2 by the Nebraska State Association of Secondary School Principals. She was nominated by Logan View principal Rochelle Clausen and put through a selection process. Petersen was presented a plaque at the NSASSP gathering April 25. Region 2 is made up Burt, Cass, Dodge, Douglas, Otoe, Sarpy and Washington counties. Petersen is completing her 10th year as principal at North Bend Central middle and high school this year. Prior to that she was an assistant principal at Schuyler for three years and taught social science at NBC for five years. Petersen didn’t always have her sights set on being a principal. When she graduated from high school, she was going to be a physical therapist but quickly decided that it was not for her. She then declared elementary education her major but soon decided that wasn’t the right fit either. Then she took a psychology class and was hooked. After graduating from Midland Lutheran College, she taught then obtained her masters and became a principal.